Nic focuses on athletes who have special considerations in their schedules, bodies and lives. Nic Ruley is a USAT Level 1 coach and USMS Level 2 coach with a focus on adults who would like to improve their swim times and triathletes who have special considerations in their schedules, their bodies, and their lives. Nic coaches both group training and private coaching for those athletes wanting to win a sprint triathlon to those who want to try their first Ironman. Nic is a ‘late in life’ athlete who came to the sport when he turned 30, in the hopes of meeting people and getting in shape. 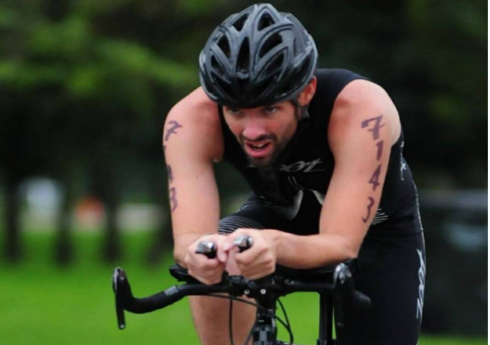 Since then, he found triathlon to be the greatest form of self-care on his road to sobriety. His first triathlon was nothing short of a disaster, which led him immediately to his second, in hopes of having a more positive experience. It was. He has never looked back. His favorite athletic moment was racing USAT Nationals in 2015 wearing nothing but a speedo. The water temperature was 60 degrees. Nic is extraordinarily passionate about the transformational effects of the sport, and his coaching style is single athlete focused and his love of the sport is infectious. His pedagogical approach is to lead the athlete to their personal fitness goals, while pushing the athlete to assure that they meet their own expectations. Realizing that most age group athletes have families, lives and budgets, Nic hopes to work with athletes to find the balance that makes triathlon work for them on their path to achieving success. When he is not working out, he is a professor at Columbia College Chicago teaching courses on race, culture and media ethics. To get started with Nic or learn more, email us!